Memory Lane Friday is a time to preserve your memories for your family. Each week has a different theme. This week's theme is 'A Time You Were Scared'. As a kid, one of my favorite things was to go visit my cousins. They had so many fun things to do and their mom, Carolyn (my mother's sister) was slightly more permissive than my own mom. Me, cousin Kristin, aunt Carolyn in back with my baby brother Taylor, cousin Brandon. Visiting their house during the summers was like opening the doors to an adventureland. Bikes with no brakes, crawdad hunting in the creek, secret trails and bb guns. What more could a kid ask for? Which I wasn't allowed to watch. First, my cousins broke me in easy. They took me to see Jaws in 3D. A little jumpy in the movie seat? Sure. Then my cousins really let me have it. And then they SWORE me to secrecy. I wasn't to tell my mom I'd been allowed to watch it. Copyright on this was 1983, so I'm guessing I was 8 or 9 when I watched it. I remember sitting on the couch in their basement with my cousins while I watched it, in horror of course! Course it was only rated PG - the rating of PG-13 didn't exist yet. The part of the movie I remember clearly is a scene towards the end involving the basement. There was a well in the creepy basement full of boiling liquid that was supposedly a portal to Hell. One character is burned and dragged into the depths of the well by a demon, before the entire house catches on fire and starts exploding. 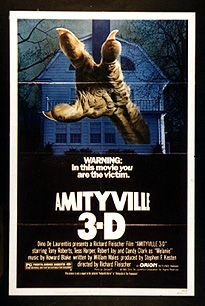 True to my promise, I didn't tell my parents I'd seen Amityville. But a couple of months later my family took a trip to Asheville to look at houses. My parents were considering moving there. As we toured through different houses, we visited an old tudor. Things started just fine as we walked through the house, room to room. Until we went down in the basement. For there, in the basement, was the scene from Amityville just waiting for me. The tudor's basement looked JUST LIKE the basement from Amityville 3D! My parents were charmed by the house. Meanwhile I was begging and pleading in terror "YOU JUST CAN'T BUY THIS HOUSE". "Why?" they asked me, perplexed. And I couldn't tell them "Because it's CURSED you fools! We will be devoured by demons if you buy this house! Just like in Amityville horror!" Nope, I couldn't betray my cousins that way. So I blubbered and sobbed much to their bewilderment. Luckily, they decided in the end not to move to Asheville. Just grab the code below the button and copy/paste it into your blog. Be sure to come back next week. The theme is 'My Dad' and it's a chance for you to tell stories about your father just in time for Father's Day. I'm pretty sure I can dig up a few good ones about my dad! horror movies would be so much scarier in 3D! Great post!! That would have scared the crap out of me too!! I was thinking about doing the Memory Lane Friday, is there some place that has the theme's set or do you just come up with your own? Thanks for helping me out! Ahhh, some great 80s scary movies! 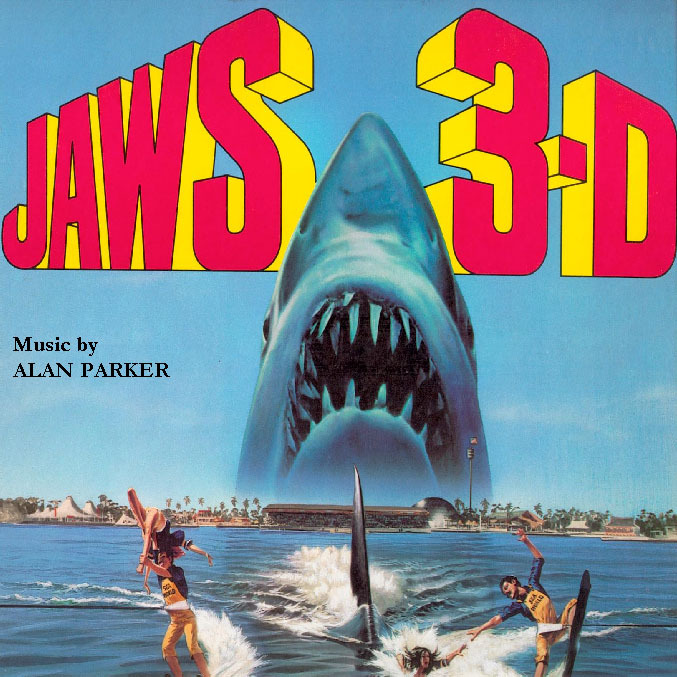 I think I actually saw Jaws 3D in the theater with my Dad, of all people! Hahaha! Those are fun memories about scary times! Guess I join in but have nothing I can think f right off hand. This way it will give me a week to come up with something for next week.